The first things that get packed when I’m on the move are my running gear and my swimming things. Once they’re all safely in the bag, everything else can go in. Let’s start by saying that I was last in Belgrade in 1981 and a fair bit has — as we know — happened in that part of the world since then. The city was still the capital of Yugoslavia 36 years ago, with all that country’s assorted moving parts pretty solidly in place and President Josip Broz Tito only dead a year. Now — after much Balkan bloodshed, suffering and reshuffling — Belgrade has retrenched and is solely Serbian again. So I wasn’t sure what to expect. The prime driver for this pilgrimage was reconnecting with a friend I hadn’t seen for nearly as long, the daughter of a couple I’d made friends with on a Montenegrin beach way back in the 1960s when I was just seven. The last time we met, she was 16 and in the UK to learn English, and I was in my 20s — we had a fair bit of ground to cover! I’m never keen on ploughing through crowds and traffic when I’m running, so as my AirBnB was in a typical Belgrade tenement in Zeleni Venac, five minutes from the Sava riverbank, I headed there first. And as I followed a newly-finished walkway upstream, I came across a perfect example of the contradictions now threading through the city. This part of Belgrade is being redeveloped on a grandiose scale, the objective to create something that wouldn’t look out of place in Dubai. And that’s not surprising as it is Emirates money that’s driving this 90-hectare project — Belgrade Waterfront — led by Abu Dhabi-based Eagle Hills with apparently precious little local involvement. When I ask my friend and my Airbnb host who will buy the first phase of luxury apartments now nearing completion, they both shrug wearily. It won’t be them, or any other city resident they know. Arabs, most likely, they say. Or Russians. And it’s this shift in mood that I noticed the most: the Belgrade I remember as a teenager and young adult had a lightness about it, optimism, almost a sense of shared purpose, and huge pride in the city. People laughed a lot and seemed to find much to enjoy and celebrate. Yes, they wanted more of the consumer goods I took for granted in the UK, and they bitched a lot about Tito, but my friend grew up in an attractive suburb, her house had a garden, there was always a car, holidays, and money for extras. Now Belgrade residents have access to a consumer cornucopia: multiple McDonalds’s across the city, many neighbourhood malls, and on the main, traffic-free shopping street you could pretty much be anywhere. A huge H&M opposite a huge Zara, a SuperDry about to open, Accessorize, Gap, L’Occitane, Adidas, and so it goes. There’s also the enormous new three-storey Rajićeva Shopping Center, all glass and ubiquitous flashy marble, that’s home to designer brands with price tags way out of reach for 95% of Belgrade’s shoppers. So who makes up that opulent 5% who can afford them? My friend shrugs again. The people on the inside, who know how to play the system, know how to make the money work, know who to reward in return for opening the right doors. Oh, and maybe the tourists. Or the Russians. 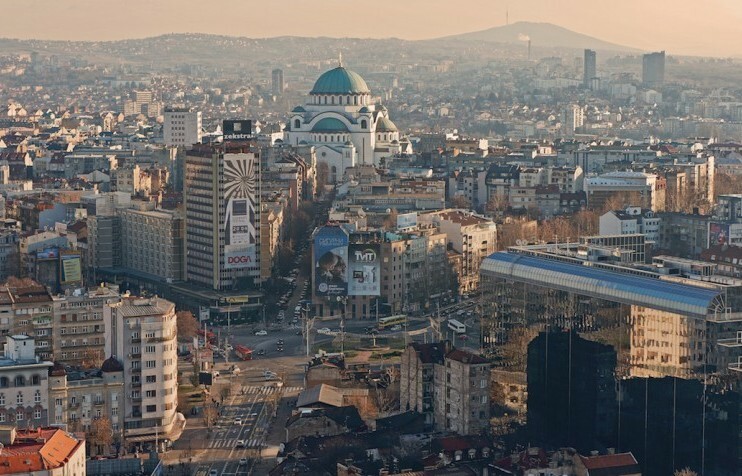 There is no longer a middle class in Belgrade, she says. You’re rich or you’re not rich — her children are growing up with a standard of living and quality of life that’s in many ways lower than hers had been, despite their access to so much more stuff. But you can’t keep a great city down altogether, and while Belgrade is not as easy on the eye as other Balkan capitals, it still has its fair share of stunning architecture and beautiful open spaces, not to mention the confluence of two major rivers — the Sava and Danube. And what I love most is its unique mish-mash of styles, the legacy of hundreds of years of power changing hands, from west to east and back again, destruction and resurrection, all rounded off by Tito’s socialist vision and now whatever the 21st century has in store. As I ran and walked Belgrade’s streets I did find much that was reassuringly familiar: the Cyrillic alphabet that is still the first choice for signage everywhere (memo to self: maybe time to learn to read it properly? ), the large number of people who speak immaculate, colloquial English, the kiosks on every corner, the trams and trolley buses, and those loud and un-self-conscious public exchanges that always feel like they’re teetering on the edge of argument (mobile phones have added a whole new dimension to this). More about my trip to come, including a gorgeous lake swim, the honey fair, a day out in Novi Sad, and some air-brushed military history.